Mmmmm, grilled cheese sandwiches served alongside bowls of steaming hot tomato soup – it’s the meal that speaks to my heart like no other. I am instantly transported back to my childhood, swinging my feet under the chair because they don’t reach the ground. I no longer have adult responsibilities and life is simpler. If only it were that easy to turn back the clock. If we had grown up in France instead of America, we would have asked for Croque Monsieur sandwiches. Ham with shredded Gruyere and a creamy bechamel sauce poured over the top. And if we were living large, it would have been a Croque Madame which is the same sandwich with a fried egg on top. Comforting, satisfying, and incredibly rich, either of these makes the perfect meal for a special occasion. 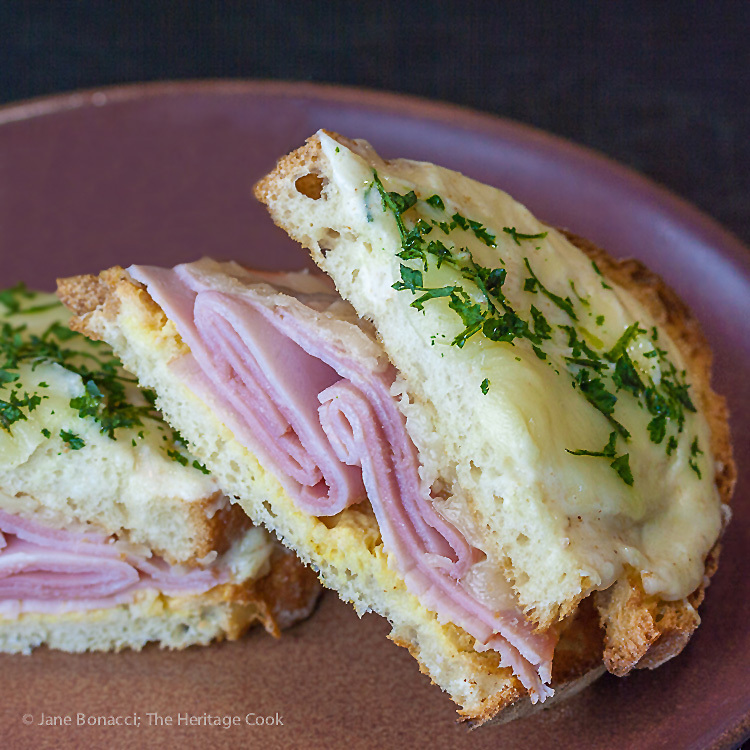 One thing that really sets this apart from ordinary ham and cheese sandwiches is the cheesy bechamel sauce that you pour over the top and then broil until bubbling and melted. The blending of the creamy, smooth bechamel sauce and grated Gruyere is brilliant. The natural bite of the cheese is mellowed by the lush sauce and the two together are addicting. If you cannot find Gruyere, any Swiss-style cheese will work. Talk about decadent! The French really know how to live. When the cheeses melt in the sauce, it gets quite stringy. If it is too thick, whisk in small amounts of milk (no need to warm it) until it becomes smooth. You want it fairly thick so it will stay on top of the sandwiches when you spread it over the bread. Ready for the toppings! Or serve them like this, heated enough to melt the cheese. The cheese sauce takes the place of the usual butter in these “grilled” sandwiches. We get plenty of luscious fat from the blend of cheeses, so I promise you won’t even miss the butter! If you want, you can cut the crusts off before toasting the bread for a sandwich that is easier to cut. When the sandwiches are served with the cheese sauce ladled over the top, they can get pretty messy and are much easier to eat with a fork and knife. Yeah baby – ready for the broiler! This is definitely not the recipe you want to make on a regular basis because it does have a lot of ooey, gooey cheese. But once in a while, when the mood strikes and you just need a little self-indulgence, this is definitely the way to go! This is one of the quintessential French dishes that we enjoyed during our last visit to Paris. One bite and I am back alongside the Seine, watching people as we sit outside a little bistro. Listening to the chatter of people deep in conversations in French – not understanding a word but getting the nuances of emotions. I love the simplicity of this meal, so common in France and a vast improvement over what we normally eat here. For the most authentic French experience, definitely give this a try. C’est magnifique! Pre-grated softer cheeses, like cheddar and Swiss, may be convenient but they are not the best choice for sauces. The additives they contain to help keep the strands from sticking together during packaging also prevents it from melting smoothly. Buy blocks of cheese and shred it yourself for the best sauces. The exception is hard cheeses like Parmesan – those you can buy pre-grated and save a lot of time. But PLEASE don’t buy the stuff in the green can – if that is all you can find, buy a chunk of Parmesan and hand grate it. You can shred the cheese by hand, but if you have a food processor with a shredding disk, now is the time to pull it out. I can shred the cheese for this recipe in about 30 seconds, saving me and The Artist a lot of work. If you have little one who want to help, this is a good job for them – supervised of course. Make sure the block is big enough to protect their knuckles or better still use a rotary shredder! I recommend replacing the all-purpose flour with either sorghum or a GF flour blend. You can use the sorghum 1:1, but gluten-free flour blends contain starches so you don’t need as much for thickening. In addition to reducing the amount of the flour by about 2 tbsp, you may need to add a little more milk. Remember that the sauce will thicken as it stands, so make it just a touch thinner than you want the final product to be. Preheat the oven to 400°F. Note: If your oven has a “Toasting” feature, you can use that instead. Make the Cheese Sauce: Place the milk in a saucepan and warm over medium heat to just below a simmer. There will be tiny bubbles around the edges of the pan and steam rising from the milk’s surface. Pour into a Pyrex or other heatproof glass measuring cup with a spout. Wipe out any residual milk sugar in the bottom of the pan. Place the saucepan over low heat and add the butter. When the butter is fully melted, whisk in the flour. Cook for 2 minutes, whisking constantly, until the raw flour aroma is gone and the mixture begins to smell slightly nutty. Whisking vigorously, slowly pour the hot milk into the butter–flour mixture and cook, until the sauce is thickened, about 3 minutes. Get the sauce as thick as you want now because you cannot boil it once the cheese is added. Remove the sauce from the heat and whisk in the salt, pepper, nutmeg, 1/2 cup of the grated Gruyere, and all the Parmesan, stirring until smooth (see Hints and Tips above). Set aside. Toast the Bread: Cut the crusts off the bread slices and place on 2 baking sheets. Bake for 5 minutes. Flip each slice over and bake for another 2 minutes, or until toasted and browned on both sides. Assemble and Cook the Sandwiches: Lightly brush half the toasted breads with mustard on one side, place a slice of ham on top of the mustard smeared bread, and evenly sprinkle with 2-1/4 cups (half of the remaining) Gruyere. Top each with another piece of toasted bread to make 8 sandwiches. Ladle the cheese sauce over the top of each sandwich, sprinkle with the remaining grated Gruyere, and slide the baking sheet back in the oven. Bake the sandwiches for 5 minutes to warm the ham. Turn on the broiler and broil for 3 to 5 minutes, or until the topping is bubbly, melted, and just starting to brown in spots. Sprinkle with the parsley and serve hot. * Gluten-free flour blends contain starches that are more efficient thickeners than plain flours. You may not need as much if you are using a GF flour blend.